Raw Organic Whey produces some of the market’s best whey protein products, sourced from locally-owned farms filled with happy grass-fed cows. Their Organic Whey Protein Powder offers a refreshing change in pace from your typical protein supplement. 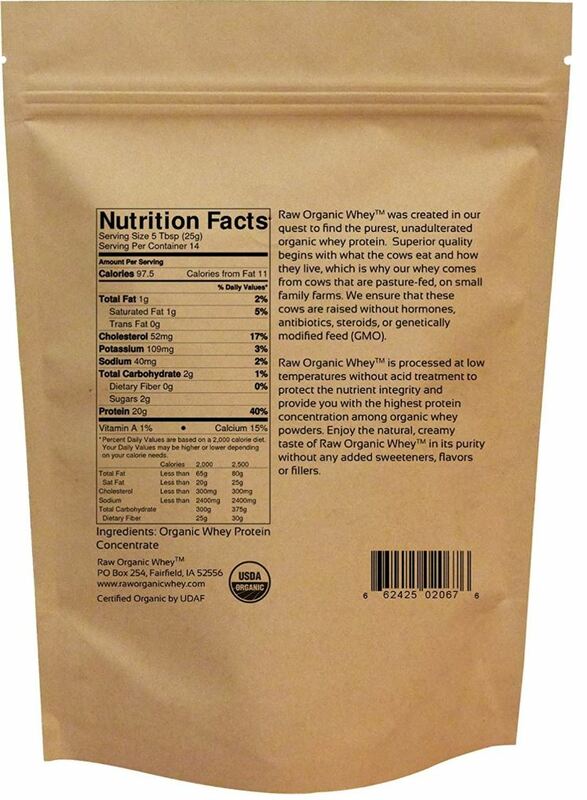 Raw Organic Whey’s protein powder is USDA Certified Organic, and is also free from GMOs, soy, gluten, and corn. This Organic Whey Protein Powder contains a single ingredient—organic whey protein—and avoids using lecithin compounds for easier mixing. The whey protein in this products is processed without the use of harmful chemicals, or damaging high temperatures. Raw Natural Whey has truly put together a fantastic nutritional product, and have been rapidly gaining interest from health conscious buyers. If you are working to build new muscle, this organic whey protein is loaded with a super dense amino acid profile, known to help avoid catabolic states and build lean muscle. Gram for gram, this is a great protein powder product, and is tons better than nearly any protein powders found in most stores. Your body uses amino acids to help perform many vital functions on a daily basis. One of the main uses for amino acids is the building of new muscle. Your body is so obsessed with building proteins out of amino acids, that if you don’t have a fresh supply, your body will actually begin to break down existing muscle make new amino acids. This is known as a catabolic process, opposite of anabolic, and can become a very serious issue if allowed to go unchecked. Raw Organic Whey’s Organic Whey Protein Powder is a perfect way to meet this issue head on, and not only help to boost your recovery times but also make your body’s ability to synthesize proteins more efficient. Whey protein powder is regarded by many as having the most effective amino acid profile of any protein powder product containing a single ingredient. Specifically, whey protein has been shown to not only trigger an increase in available amino acids, but also to make the process your body uses to synthesize protein more efficient. Ingredient quality encompasses much more than just what is on the label of your supplements. It extends all the way to the how those ingredients are made, and where they come from. Many protein powders are made from milk that comes from commercially-ran cattle farms. These types of farms cram as many cows into as small an area as legally allowed, and often pump all sorts of nasty chemicals into them to help make this possible. To help increase profits, many commercial cattle farms inject their cows with a growth hormones called rGBH. While this might help those farms achieve better bottom lines, it can also cause your body to become quite confused when found in your dinner. Another important part of what makes Raw Organic Whey’s whey protein powder commendable is it’s sourcing from grass-fed farms only. Cattle that are fed wheat straws and corn are notoriously high in levels of potentially dangerous compounds such as GMO wheat particles, and even harmful pesticide residue. You are what you eat, and so are cows. If the protein powder you have on your shelf is sourced from GMO fed cattle, you might as well be eating it right along with them. Another important factor that makes this organic whey protein such a wonderful product is that Natural Organic Whey produces it without the use of harmful acids. These types of processing practices allow for quicker batch turn-around times, and are attractive to many companies who are only concerned with their bottom line. These types of chemicals can damage beneficial compounds such as amino acids, branched-chain amino acids, lactoferrin, and many others found in whey protein. By using alternative processing methods, Raw Organic Whey is able to help better preserve the full potential of their protein powder products. One controversial means of processing, is the pasteurization of milk products in the United States. Any product that crosses State lines is required by the FDA to undergo a pasteurization process to help prevent food-born illnesses. It’s important to understand that every whey protein powder has to undergo this process and unless you’re making your own there’s little way to avoid it. Raw Organic Whey does what they are able to minimize the damage during this process, and utilize a single flash pasteurization method which heats the milk to ~160 degrees for 15 seconds. This is thought to help preserves as many beneficial compounds as possible, while still complying with federal laws. Raw Organic Whey is a fairly new company compared to many more established brands. The marketplace for protein powder is extremely competitive, and newcomers must fight tooth and nail to elbow out some space. Many amazing products such as this organic whey protein powder aren’t yet being discovered by consumers because large retailers are so locked in on the gigantic brands that use subpar ingredients. Fortunately the internet has allowed people better access to Organic products in recent years. This increased access is likely responsible for the surge in demand of Organic products, with no decrease in sight. Raw Organic Whey’s Organic Whey Protein Powder is available for purchase through their official website, as well as other online retailers. 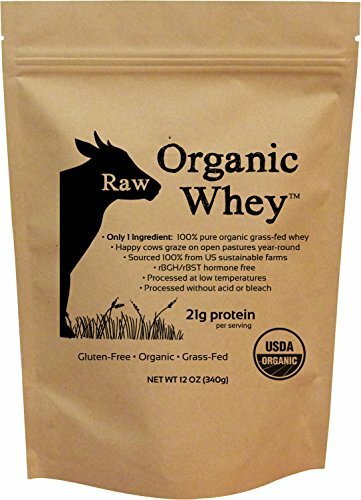 Raw Organic Whey’s protein powder is also available for purchase through Amazon, and qualifies for free shipping for those with Amazon Prime memberships. Raw Organic Whey’s products have received a very high number of 5 star reviews, and are one of the most-popular Organic Whey Protein Powders available today. 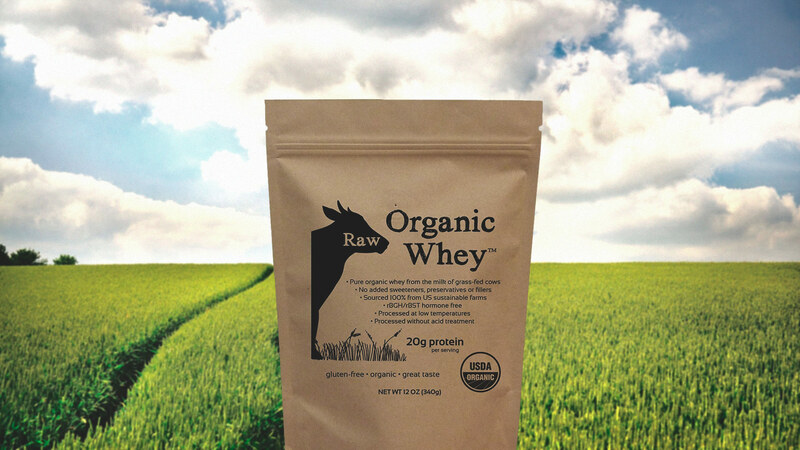 Raw Organic Whey takes their name seriously, and their Organic Whey protein powder is sourced from healthy pasture-raised cattle fed a grass only diet. This USDA Certified Organic protein powder offers access to a dense profile of un-denatured amino acids and immune-boosting compounds.